This model has reached end of life. Please contact our sales team for possible replacement models. The Datalogic QuickScan Mobile barcode scanner provides any business a fantastic combination of presentation scanning and cordless barcode scanning. Built with retail and light industrial scanning in mind, the QuickScan Mobile is ideally suited for grocers, big box retailers, or any location where you might need greater freedom of motion than you would get from a cabled scanner. The QuickScan Mobile uses Datalogic´s Star Cordless System to maintain radio contact with the charging/communications cradle. With an effective radio range of 40 feet, the QuickScan Mobile offers retailers easy mobility within their store. 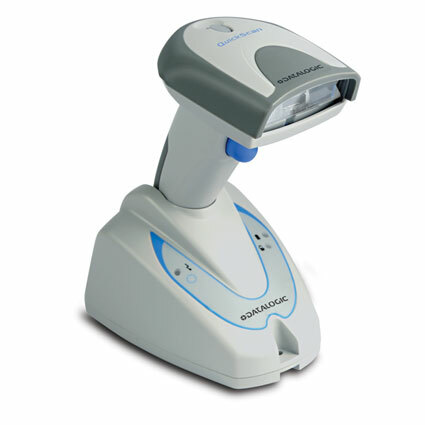 For added convenience, the barcode scanner pairs with the cradle by simply seating the scanner. As a linear imager, the QuickScan Mobile can read retail barcodes from up to 9 inches away, ideal for general retail scanning. The scanner supports standard barcodes including GS1 Databar, allowing you to scan not only products but labeled produce. The lightewight QuickScan Mobile has been built to hold up to general day-to-day use. Reinforced plastics and a lack of moving parts protects the barcode scanner from drops of five feet to concrete, and Datalogic sealed the housing against dirt and other particulates that can damage internal components. 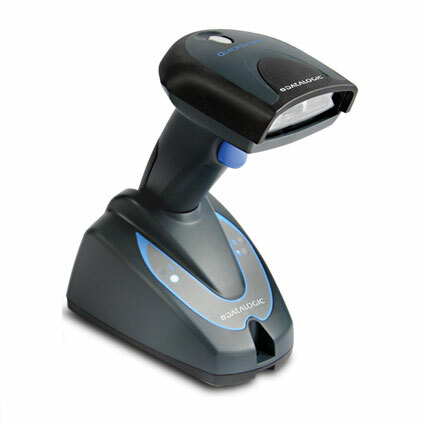 Shipping with a 3-year warranty, the Datalogic QuickScan Mobile barcode scanner will provide many years of great service. • Reader: 2.80" x 3.54" x 6.72"
• Cradle: 3.54" x 5.11" x 3.15"
5 Mil 1.4" to 4.1"
7.5 Mil 0.6" to 5.3"
10 Mil 0.2" to 6.6"
13 Mil 0.4" to 8.4"
20 Mil 0.4" to 10.5"